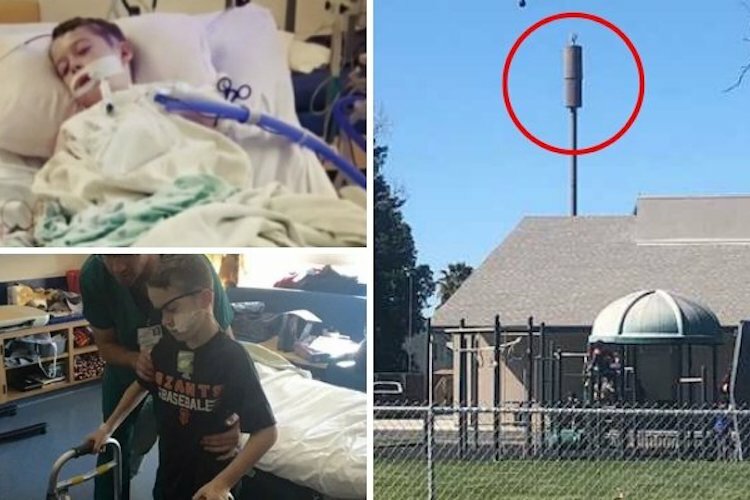 Parents of students at a San Joaquin County elementary school in California are demanding that the district remove a cell phone tower that was installed on the property a few years ago, due to concerns that the tower is giving children cancer. Four students have been diagnosed with cancer since the towers were installed and parents are no longer convinced that this is a mere matter of coincidence. Monica Ferrulli, the mother of one of the children diagnosed with cancer, says that her son’s doctors have indicated that this specific type of cancer is caused by something the patient was exposed to in their environment. “We had a doctor tell us that it’s 100 percent environmental, the kind of tumor that he has,” Ferrulli told CBS Sacramento. Joe Prime, another parent who now has a child battling cancer as well, says that the towers need to go before more people are exposed. “It’s one of the hardest things that I’ve been through. It just seems like coincidence is no longer a reason for all this illness. Kids shouldn’t be guinea pigs, and we shouldn’t be taking chances with the children’s lives,” Prime said. “It’s a real disappointment that it’s taking moms of sick children and dads of sick children to come out and say something needs to be done,” Prime added. Parents want the tower removed, but the district refuses to acknowledge the situation, instead insisting that they have tested the area and everything meets federal regulations. However, Sprint provides the school district with a kickback of $2,000 per month for the tower and some parents think that this is playing a role in the district’s decision to keep the tower. Experts say that regardless of federal standards, it is dangerous to have young children by in such close proximity to these devices on such a regular basis. Eric Windheim, an electromagnetic radiation specialist, says that these frequencies can have an effect on the cells of children because they are still growing and developing. “I wouldn’t send my kids there at all, it absolutely is dangerous. Children are still developing, and their cells are still being divided. It’s the worst possible time in their life to be exposed. Instead of only going 300 yards like regular Wi-Fi, Y-Max can go 30 miles,” he said. The school district recently sent a letter to parents saying that they have no plans of taking the cell towers down because the frequencies are below federal standards. The statement also noted that there is no way for them to get out of their contract with Sprint, and that the company would have to move the tower on its own. “There’s a lot of kids that we love that still go to the school, so we are fighting for them,” Ferrulli said.